The first JNF collection box was actually Theodor Herzl’s hat. At the Fifth Zionist Congress in 1901, Herzl removed his hat and asked delegates for donations to purchase land in Eretz Yisrael to re-establish a Jewish homeland. Two weeks later, the iconic Blue Box, or pushke, was born. 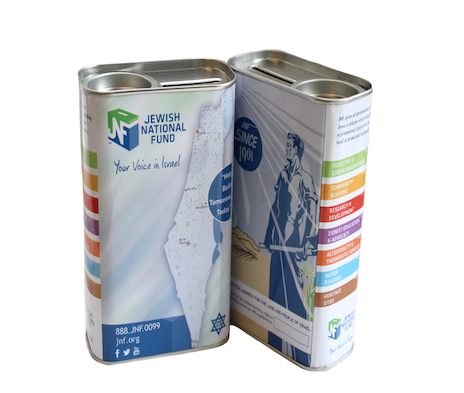 Stamped with the words “National Fund,” small tin boxes were distributed to Jewish communities across the globe and numbered over a million by World War II. Their impact was immediate, generating vital funds to develop and cultivate the land of Israel. For many people, the Blue Box is an integral part of childhood memories. More than a century after its creation, it remains a powerful symbol of the link between Diaspora Jewry and the people of Israel. This item is only available for shipment to U.S. addresses. For shipment outside the U.S., please contact your local JNF office. Click here for our listing of world-wide JNF offices. JNF certificates can now be purchased with the option of a 100% eco-friendly wood composite frame, with a rich Brazilian walnut finish. See finishing options for pricing. * How many Blue Boxes would you like?